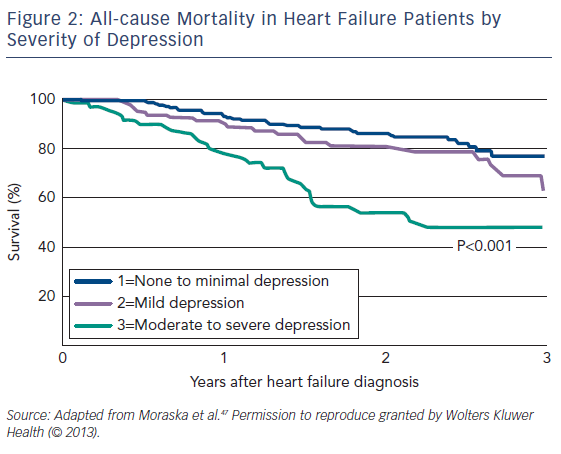 » Depression in Patients with Heart Failure: Is Enough Being Done? Depression in Patients with Heart Failure: Is Enough Being Done? Depression is a major issue in heart failure (HF). Depression is present in about one in five HF patients, with about 48 % of these individuals having significant depression. There is a wide variation in reported prevalences because of differences in the cohorts studied and methodologies. There are shared pathophysiological mechanisms between HF and depression. The adverse effects of depression on the outcomes in HF include reduced quality of life, reduced healthcare use, rehospitalisation and increased mortality. Results from metaanalysis suggest a twofold increase in mortality in HF patients with compared to those without depression. 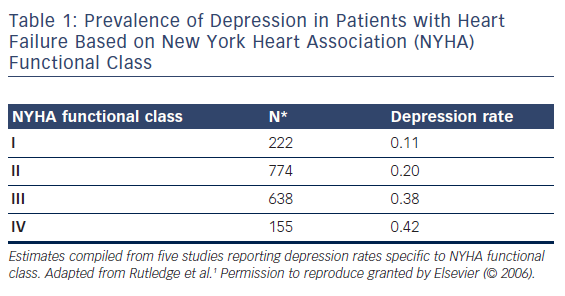 Pharmacological management of depression in HF has not been shown to improve major outcomes. No demonstrable benefits over cognitive behavioural therapy and psychotherapy have been demonstrated. The aggregated point prevalence of depression in HF patients is about 21 %;1 however, the figures reported in studies range from 9 to 60 %.1 The aggregated prevalence for women is higher than for men, with 32.7 % (range 11–67 %) of women being depressed compared with 26.1 % (7–63 %) of men.1 The prevalence of depression increases with New York Heart Association (NYHA) functional class, with the biggest difference seen between NYHA classes II and III (see Table 1). The heterogeneity in the reported prevalence of depression is related to various factors, such as: the method of assessing depression (questionnaire versus structured interview); conservative versus liberal cut-offs for depression diagnosis; the severity of HF, mean patient age, ethnicity and gender; and inpatients versus outpatients. The plethora of depression symptom inventories, including the Beck depression inventory,16 Zung self-rating depression scale,17 geriatric depression scale,18 Center for Epidemiological Studies – depression scale,19 hospital anxiety and depression scale,20 inventory to diagnose depression,21 Hamilton rating scale for depression,22 Hopkins symptom checklist,23 medical outcomes study – depression24 and multiple affect adjective checklist,25 has also contributed to the heterogeneity (see Figure 1). Despite these interrelationships between depression and CVD, no causal relationship has yet been demonstrated. Most of the studies in this area were case-controlled or cross-sectional, but they did not control for behavioural mediators such as poor treatment adherence. There is still no consensus on the best way to treat HF patients with depression. Studies have shown improvement in depressive symptoms with the use of SSRIs;14,15,43,44 however the large Setraline Against Depression and Heart Disease in Chronic Heart Failure (SADHART)14 and Morbidity, Mortality and Mood in Depressed Heart Failure Patients (MOOD-HF)15 trials failed to show any significant benefit over placebo. No clear benefits were shown between usual care (optimal HF treatment without antidepressants) and the use of SSRIs in SADHART or MOOD-HF. Depression is a common finding in patients with HF and constitutes an additional burden on the management of these patients. Wide variations in reported prevalence rates are due to varied cohort characteristics and the multiplicity of instruments and methodologies used. The presence of depression, however, leads to poor outcomes, morbidity and mortality. Treatment with newer SSRIs, although effective, does not improve outcomes and is not superior to cognitive behavioural therapy and psychotherapy. There are still many knowledge gaps to fill and issues to be addressed. Rutledge T, Reis VA, Link SE. Depression in heart failure: a meta-analytic review of prevalence, intervention effects and associations with clinical outcomes. J Am Coll Cardiol 2006;48:1527–37. Konstram V, Moser DK, De Jong MJ. Depression and anxiety in heart failure. J Card Fail 2005;11:455–63. Parissis JT, Fountoulaki K, Paraskedvaidis I, et al. Depression in chronic heart failure: novel pathophysiological mechanisms and therapeutic approaches. Expert Pin Investig Drugs 2005;14:567–77. Ponikowski P, Voors AA, Anker SD, et al. ; Authors/Task Force Members. 2016 ESC guidelines for the diagnosis and treatment of acute and chronic heart failure. Eur Heart J 2016;37:2129–200. Sullivan MD, Levy WC, Crane BA, et al. Usefulness of depression to predict time to combined end point of transplant or death for outpatients with advanced heart failure. Am J Cardiol 2004;94:1577–80. Jiang W, Alexander J, Christopher E, et al. Relationship of depression to increased risk of mortality and rehospitalisation in patients with congestive heart failure. Arch Int Med 2001;161:1849–56. Junger J, Schellberg D, Müller-Tasch T, et al. Depression increasingly predicts mortality in congestive heart failure. Eur J Heart Fail 2005;7:261–7. Rumsfield JS, Havranek E, Masoudi FA, et al. ; Cardiovascular Outcome Research Consortium. Depressive symptoms are the strongest predictors of short-term declines in health status in patients with heart failure. J Am Coll Cardiol 2003;42:1811–7. Sullivan M, Simon G, Spertus J, et al. Depression-related costs in heart failure care. Arch Intern Med 2002;162:1860–6. Cline CMJ, Israelsson BYA, Willenheimer RB, et al. Cost effective management programme for heart failure reduces hospitalization. Heart 1998;80:442–6. Freedland KE, Rich MW, Skala JA, et al. Prevalence of depression in heart failure patients. Psychosom Med 2003;65:119–28. Mbakwem AC, Aina FO. Comparative study of depression in hospitalized and stable heart failure patients in an urban Nigerian teaching hospital. Gen Hosp Psychiatry 2008;30:435–40. Gottlieb SS, Khatta M, Friedman E, et al. The influence of age, gender and race on the prevalence of depression in heart failure patients. J Am Coll Cardiol 2004;43:1542–9. Angermann CE, Gelbrich G, Stork S, et al. ; MOOD-HF Investigators. Rationale and design of a randomized, controlled, multicenter trial investigating the effects of selective serotonin re-uptake inhibition on morbidity, mortality and mood in depressed heart failure patients (MOOD-HF). Eur J Heart Fail 2007;9:1212–22. Beck AT. Depression Inventory. Philadelphia, PA: Center for Cognitive therapy, 1978. Zung WWK. A self-rating depression screening scale. Arch Gen Psychiatry 1965;12:63–70. Yesavage JA, Brink TL, et al. Development and validation of a geriatric depression screening scale: a preliminary report. J Psychiatr Res 1982–1983;17:37–49. Radloff L. The CES-D Scale: a self-report depression scale research in the general population. Appl Psychol Meas 1977;1:385–90. Zigmond AS, Snath RP. The hospital anxiety and depression scale. Acta Psychatr Scand 1983;67:361–70. Zimmereman M, Coryell M, Corenthal C, et al. A self-report scale to diagnose major depressive disorder. Arch Gen Psychiatry 1986;43;1076–86. Hamilton M. Development of a rating scale for primary depressive illness. Br J Soc Clin Psychol 1967;6:278–46. Lipman RS, Covi L, Shapiro AK. The Hopkins symptom checklist (HSCL)-factors derived from the HSCL-90. J Affect Disord 1979;1:9–24. Nagel R, Lynch D, Tamburrino M. Validity of the medical outcomes study depression screener in family practice training centers and community settings. Fam Med 1998;30:362–5. Zuckerman M, Lubin B. The Multiple Affect Adjective Check List. San Diego, CA: Educational and Industrial Testing Service, 1965. Hu K, Gaudron P, Bahner U, et al. Changes of atrial natriuretic peptide in brain areas of rats with chronic myocardial infarction. Am J Physiol 1996;270:H312–6. Hu K, Bahner U, Gaudron P, et al. Chronic effects of ACEinhibition (quinapril) and angiotensin-II-type receptor blockade (losartan) on atrial natriuretic peptide in brain nuclei of rats with experimental myocardial infarction. Basic Res Cardiol 2001;96:258–66. Ertl G, Hu K, Gaudron P, et al. Remodeling of the heart post myocardial infarction: focus on central ANF. Basic Res Cardiol 1997;92:82–4. Hemman-Lingen C, Binder L, Klinge M, et al. High plasma levels of N-terminal pro-atrial natriuretic peptide associated with low anxiety in severe heart failure. Psychosom Med 2003;65:517–22. Hughes JW, Watkins L, Blumenthal JA, et al. Depression and anxiety symptoms are related to increased 24h-hour urinary norepinephrine excretion among healthy middleaged women. J Psychosom Res 2004;57:353–8. Craney RM, Freeland KE, Veith RC. Depression, the autonomic nervous system and coronary heart disease. Pschosom Med 2005;67:S29–33. Musselman DL, Tomer A, Mnatunga AK, et al. Exaggerated platelet activity in major depression. Am J Psychiatry 1996;153:1313–7. Bruce EC, Musselman DL. Depression alteration in platelet function and ischaemic heart disease. Psychosome Med 2005;67:S34–6. Ross R. Atherosclerosis – an inflammatory disease. N Engl J Med 1999;340:115–26. Capuron L, Ravaid A, Miller AH, et al. Baseline mood and psychosocial characteristics of patients developing depressive symptoms during interleukin-2 and/or interferonalpha cancer therapy. Brain Behav Immun 2004;18:205–13. Xiong GL, Prybol K, Boyle SH, et al. ; SADHART-CHF Investigators. Inflammation markers and Major Depressive Disorder in Patients with Chronic Heart Failure: Results from the Sertraline against Depression and Heart Disease in Chronic Heart Failure (SADHART-CHF) study. Psychosom Med 2015;77:808–15. Kop WJ, Synowski SJ, Gottlieb SS. Depression in heart failure: biobehavioral mechanisms. Heart Fail Clin 2011;7:23–38. Orus J, Roig E, Perez-Villa F, et al. Prognostic value of serum cytokines in patients with congestive heart failure. J Heart Lung Transplant 2000;19:419–25. Rauchhaus M, Doehner W, Francis DP, et al. Plasma cytokine parameters and mortality in patients with chronic heart failure. Circulation 2000;102:3060–7. Pasic J, Levy WC, Sullivan MD. Cytokines in depression and heart failure. Psychosom Med 2003;65:181–93. Suzuki H, Matsumoto Y, Ota H, et al. Hippocampal blood flow abnormality associated with depressive symptoms and cognitive impairment in patients with chronic heart failure. Circ J 2016;80:1773–80. Kop WJ, Gottdiener JS. The role of the immune system parameters in the relationship between depression and coronary artery disease. Psychosom Med 2005;67:S37–41. Gottlieb SS, Kop WJ, Thomas SA, et al. A double blind placebo controlled pilot study of controlled release paroxetine on depression and quality of life in chronic heart failure. Am Heart J 2007;153:868–73. Laspérance F, Frasure-Smith N, Laliberté MA, et al. An open label study of nefazodone treatment of major depression in congestive heart failure. Can J Psychiatry 2003;48:695–701. Bechman LF, Blumenthal J, Burg M, et al. ; Enhancing Recovery in Coronary Heart Disease Patients Investigators (ENRICHD). Effects of treating depression and low perceived social support on clinical events after myocardial infarction: the Enhancing Recovery in Coronary Heart Disease Patients (ENRICHD) randomized trial. JAMA 2003;289:3106–16. Lundgren JG, Dahlström O, Andersson G, et al. The effect of guided web-based cognitive behavioral therapy on patients with depressive symptoms and heart failure: a pilot randomized controlled trial. J Med Internet Res 2016;18:e194. Moraska AR, Chamberlain AM, Shah ND, et al. Depression, healthcare utilization and death in heart failure: a community study. Circ Heart Fail 2013;6:387–94. Adelborg K, Schimidt M, Sundboll J, et al. Mortality risk among heart failure patients with depression: A nationwide population-based cohort study. J Am Heart Assoc 2016;5:e004137. Fan H, Yu W, Zhang Q, et al. 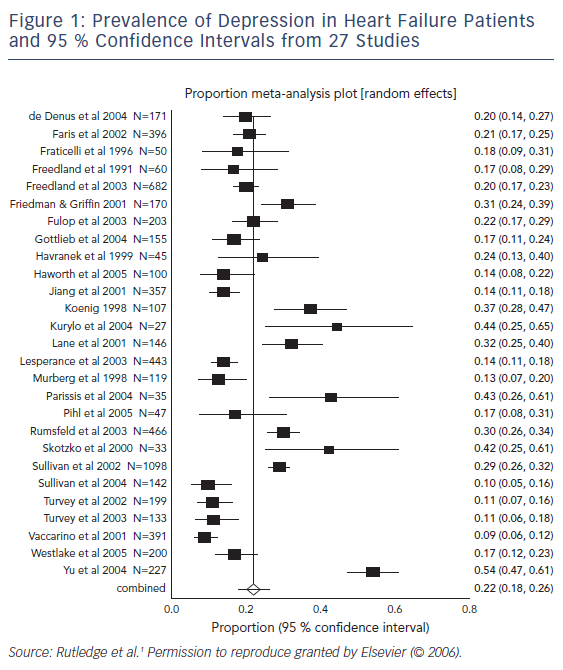 Depression after heart failure and risk of cardiovascular and all-cause mortality: a meta-analysis. Prev Med 2014;63:36–42. Adams J, Kuchibhatla M, Christopher EJ, et al. Association of depression and survival in patients with chronic heart failure over 12 years. Psychosomatics 2012;53:339–46. Faris R, Purcell H, Henein MY, et al. Clinical depression is common and significantly associated with reduced survival in patients with non-ischaemic cardiomyopathy. Eur J Heart Fail 2002;4:541–51.